Deep in the woods live a reclusive race of humanoids. Large and very hairy, they wear no clothes and live simple, peaceful hunter/gatherer lives. But these are not simple creatures. They are as intelligent as any human, and just as capable of speech and thought. They deliberately live “in harmony with nature,” as they put it, regarding all forms of tool use beyond sticks and stones as abominations that interfere with the pure flow of emotion and thought. They love poetry and music, but their first love is the natural world, and many a Wild One will spend many hours sitting contentedly, staring at a beautiful sunset or stream. While a Wild One can chat happily for hours and are usually good companions, they live mostly solitary existences deep in woods or swamps, pairing just long enough to mate and raise children (they invariably give birth to twins), which grow rapidly. Wild Ones grow to adulthood in about 10 years, and often live past 150. In times of crisis, Wild Ones will gather together in a “howl” to discuss the problem and work together to solve it, often formulating and executing plans with amazing speed. While they much prefer to keep to themselves, if a person threatens either a natural landmark or a Wild One’s child within a Wild One’s sight or smell, the perpetrator should arm themselves well or flee as quickly as possible! Wild Ones attack with unmitigated ferocity in an animal rage, with enough strength to tear a creature’s arm out of its socket. Because they spend so much time deep in natural areas, most Wild Ones develop an affinity for magic, though they never study it per se. Most Wild Ones can cast a spell or three, though they are almost always utility spells. As a friendly faction, while the party camps in or near a large forest, a lone Wild One approaches the party. She is polite, if skittish; her prior experiences with adventurers have mostly erupted into violence. She explains that a group of “robed humans” has established a permanent camp next to a beautiful tree deep in the forest, and have carved strange symbols in the tree, which would be bad enough if they weren’t also tearing up all the land around it foraging for food. She will offer two valuable rewards: she will immediately cast a useful spell or two (choose spells that would be useful for your particular party), and upon success, the party will gain the favor of the Wild Ones, who can guide them safely through any natural, wooded environment in the world. As a foe faction, the party runs across a rogue group of territorial, tribal Wild Ones who are on a crusade against any tool use within their domain. Upon entering this section of the woods or swamp, a single Wild One approaches the party and informs them that any use of their weapons, lighting fires, or otherwise use of tools is forbidden. The Wild One may answer a question or two but will leave quickly. If the party disregards this warning, a group of Wild Ones will appear and attack the party. Once any Wild One is reduced to less than half Hit Points, the entire group will escape, only to return later all healed up (though they will attack at most twice per 24-hour period). 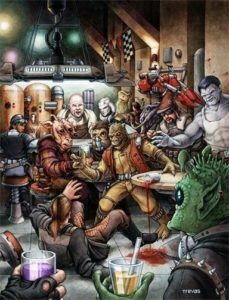 This week, only 2 of my players showed up, so we ran a Star Wars one-shot using the Risus rules. We had a blast, and these are a few recommendations if you want to do something similar. Find an adventure; websites like Star Wars RPG Adventures & Modules or Fantasy Flight’s Compiled Resource List have quite a few. Don’t worry about which system the adventure uses. Especially for a one-shot using a system that’s new to your players, choose a simple adventure with only 1-2 required combat encounters. It can be great to end your session in the middle of the story during a longer-running campaign, but if you stop just as players begin to grok the adventure, they can feel more frustrated than engaged. Read through the module and adapt the NPCs to Risus. Basically, look at their most important attributes, descriptors, and phrases, and turns those into clichés. A nameless assistant might only have a single 2-die cliché of “mook,” while a big bad guy might have several clichés like “Bounty Hunter (4),” “Cunning (3),” “Brutal (2),” “I’m Da Leader a’ Dis Outfit! (3),” “Force Sensitive (2),” etc. In general, give simpler adversaries just a couple of dice, but give bigger bad guys lots of dice. Then build a big list of clichés, catchphrases, and professions, and on game night, hand those out to your players. Give each player a piece of paper, and tell them to choose 3-5 clichés (or make up their own). Once they’re done, have them assign their 10 dice to their clichés. Some games are silly. Some games have hidden depths. Some games do both. Importantly, each player’s driven both to attempt a sacrifice, but also to prevent anyone else from successfully sacrificing his/her character. This means each player has to make up a creative sacrifice that can’t be handled by any other character’s strengths. While you’re probably not going to play this game often, it will push your creative muscles collaboratively with the other players. And isn’t that a great outcome from a game? In this game, 3+ players portray a ragtag band of heroes in a stereotypical action/horror movie, each attempting to be the first to say, “Go on without me!” Players choose 2 Strengths, 2 Weaknesses and 1 Dark Secret. One player is the Director and begins play by describing a scene. Players take turns (randomly or Director’s discretion) declaring their action and rolling a d6. On a 5 or 6, the action is successful. In order to Nobly Sacrifice themselves, their action must use a Weakness (something that prevents their character from carrying on). Other players may try to save them by reacting using a Strength (something they excel at). This reaction does not take up their action for the scene. For example, Jane rolled to stumble because of her weak ankles. Mark rescues her with his strong muscles and carries her. When all players have acted, the scene ends and a new scene begins. This is repeated until a hero finally sacrifices themselves. If your Dark Secret is discovered you can only win by rescuing another hero in a scene, and then succeed on your own (Ig)Noble Sacrifice. Jonathan Cook’s Laughter or a Lit Flame is a haiku game. Apparently, games centered on writing haikus are relatively common within the microgame scene, but whenever I’d come across the concept in the past, the game basically just told you to write haiku. Laughter or a Lit Flame provides structure to those haiku, but in an intriguingly non-competitive way. Three players alternately write haiku (three lines, five/seven/five syllables) and waki (two lines, seven syllables each). The haiku describes the protagonist, while the waki describes events befalling that protagonist. Because three individuals play, everyone gets to write some haiku and some waki. Importantly, past haiku and waki are hidden from players’ sight. This keeps players “in the moment,” focusing on what just happened. Cook even recommends that the players also chat normally while writing their poems. This addresses one significant problem with haiku-based games: haiku are hard to write. With an encouragement to weave the game in with normal conversation, the pressure’s lifted. The poems don’t even have to be good, though I suspect that focusing them in the way that this game does will ease the burden. It’s a fascinating, easy to play game, that can be quickly memorized and pulled out on a vacation, at a coffee shop, or pretty much anywhere. Paper, pens, and three players. Make us laugh. Or nod, silent. (Two lines, both of seven beats). Hide the haiku from our sight. Fold it back or cover it. Now hide the waki from view. It’s player one’s turn again. On each turn, you write. Then hide what you saw. 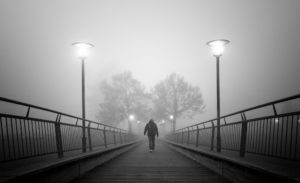 Maintain silence as you write. Reveal all and read aloud. By laughter- or a lit flame. Once you’ve completed play test, you’ll have all sorts of suggestions and advice gathered from play testers. Some of it wil be helpful; some of it won’t. However, how much of your play test feedback will actually improve your game? In other words, play testers sometimes give the wrong advice. So how do you sort that out? Read through all the feedback for quick changes that make immediate sense. This will include typos, rule rewrites that improve clarity, numeric scores that were way out of whack in play, and other things that both a) can be fixed in 60 seconds or less, and b) leap out as obvious improvements. Importantly, you’re not just changing everything that’s quick to change; these are changes that feel right just by looking at them. However, often, a play tester will give you the wrong fix for the right problem. They’ll see something that confuses them and will give you a change that would make sense to them, not to the rest of the world. So next, read through all the feedback and look for trends. Where are people confused? What didn’t work the way you wanted it to? Ignore the specific solutions for now and instead think about the fundamental problems indicated by those solutions. Note those problems separately, and then think about the best way to solve them. One of the play testers may have recommended the best solution, but more often, you’ll need to build something different. Finally, read through all the feedback one more time to ensure you’ve addressed everything. Play tests often generate many individual pieces of feedback, and it’s easy to miss one or two. Importantly, you can address a piece of feedback by ignoring it. Sometimes, a play tester will give you a straight up bad suggestion. That’s okay. The important thing is to think seriously about every piece of feedback, and if it’s wrong, cross it out. Usually, once you complete this process, you’ll find that you have a significantly different game than what you started out with. And you know what that means? You need another round of play tests. How do you know when you’re done? I’ll be addressing that in another post. Some monsters are simply beasts — strange, perhaps, but fundamentally no different than a panther or hyena. Gaxxog is an abberant creature, a thing seemingly escaped from the depths of the hells. Those who encounter Gaxxog and live to tell of it describe Gaxxog as an alternately lethargic and savage creature. 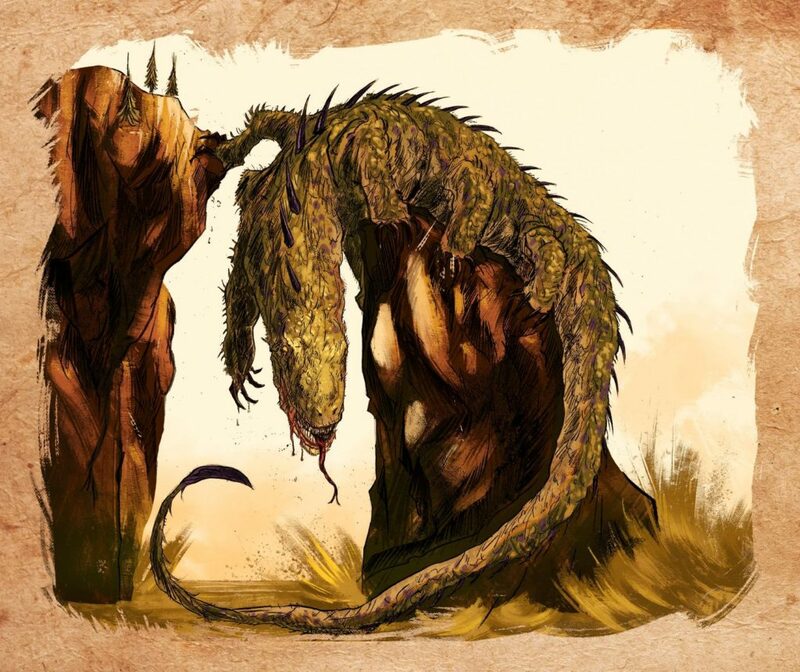 It often curls up and sleeps in a swamp or deep forest, its rough skin effectively camouflaging itself to look like a rough hillock, its spines appearing to be a line of stones. Roused, Gaxxog lashes out at anything that breathes and moves, killing indiscriminately. Given its massive bulk, one would expect Gaxxog to hunt widely and consume vast quantities of wildlife, but explorers rarely encounter it. Gaxxog must hunt somewhere else and only occasionally make itself known in our physical world. > – **Speed** 20 ft., climb 40 ft.
> ***Natural Camouflage. *** While Gaxxog is camouflaged, creatures take Disadvantage on Wisdom (Perception) checks to detect Gaxxog. This also applies to surprise rolls. > ***Spiked Back. *** A creature attempting to jump onto or grapple Gaxxog must make a DC 19 Dexterity saving throw, taking 11 (1d8 + 7) piercing damage on a failed save. > ***Multiattack. *** Gaxxog makes three attacks: one with its bite and two with its claws. It can make one tail attack in place of its two claw attacks. > ***Bite. *** *Melee Weapon Attack:* +13 to hit, reach 15 ft., one target. *Hit:* 26 (3d12 + 7) piercing damage. > ***Claw. *** *Melee Weapon Attack:* +13 to hit, reach 10 ft., one target. *Hit:* 16 (2d8 + 7) slashing damage. > ***Tail. *** *Melee Weapon Attack:* +13 to hit, reach 15 ft., one target. *Hit:* 26 (3d12 + 7) bludgeoning damage. If the target is a creature, it must succeed on a DC 19 Strength saving throw or be pushed up to 10 feet away from Gaxxog and knocked prone. > ***Acid Breath. *** Gaxxog exhales acid in a 60-foot cone. Each creature in that area must make a DC 19 Constitution saving throw, taking 52 (15d6) acid damage on a failed save, or half as much damage on a successful one. > Gaxxog begins combat with *acid breath*. The next round, it makes a *bite* and *tail* attack, the latter against the largest creature in range. After that, it settles into *bite* and two *claw* attacks every round. Some days, you want a complex, multi-faceted faction. Instead, today we have a classic force of what appear to be bad guys, but you can twist into good guys if desired. Caravans traveling through the region complain of goblins skulking around their camps. They’ve been easy to identify because each goblin wears a black headband. While they haven’t attacked anyone yet, they’re sure to be a problem eventually. Trillian Godshand, an ex-paladin in charge of security for the caravans, tasks the PCs with tracking the goblins down. You can play him as either dismissively casual about wiping about the goblins, or genuinely curious about their behavior and asking the PCs to investigate and resolve rather than destroy with extreme prejudice. Even cursory investigation will reveal tracks leading to a large stone door sunk into the desert sands/jungle marsh/forest floor, which leads down into the complex below. The goblins live here. As a friendly faction, the Fleetfoot Tribe was an average band of several dozen goblins until a few weeks ago, when their prior leader got them into a skirmish with a nearby tribe of orcs. The skirmish escalated into a massacre, and only a dozen goblins survived. They escaped, and while running stumbled across this sunken door. They entered and found themselves in an abandoned shrine and retreat for worshippers of Zattora, a benevolent goddess of wisdom. 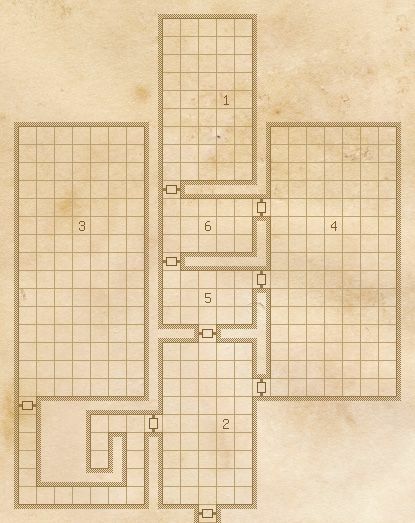 The goblins found themselves drawn into the inner sanctum (room 1 on the map), where an icon of Zattora shone brightly and a voice called out to them. The surviving goblins, in a moment of awe and humility, threw themselves at the feet of the icon and begged for guidance. Zattora responded, curious at the openness of these normally evil creatures. Over the past weeks, she has been teaching them methods of hunting and gathering that will not put them at odds with the more civilized races, and their investigation of the caravans were intended to scope out the caravans’ resources and attitude, to see if they might be open to trading with the Fleetfoots once they gather enough tradeable goods. 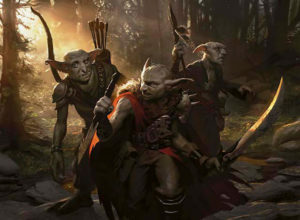 As such, the goblins will actually offer a peace branch to the PCs, explain the situation, and ask if they would work as emissaries for the Fleetfoots, trading goods with others and driving off more powerful enemies in their area (like that tribe of orcs). 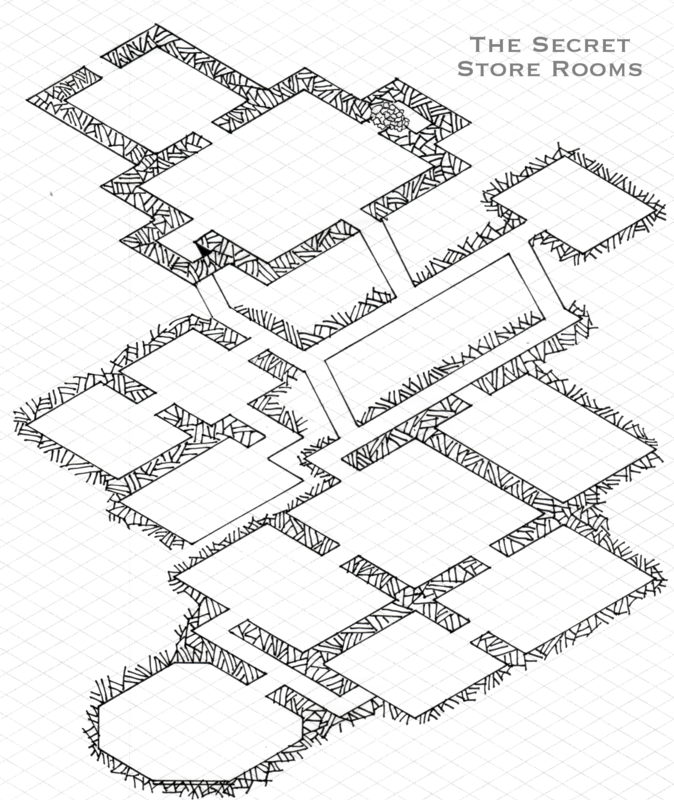 As a foe faction, the Fleetfoot Tribe similarly ran from a massacre by the orcs into this temple, but instead of a temple, this is the map of a large crypt. The goblins found themselves drawn to the inner crypt in room 1, where the spirit of Zattora the Spiteful rose from a sarcophagus, and the door to the room shut. The goblins fell to their knees, and the spirit ordered them to pledge their eternal servitude. They readily agreed. Zattora was bound here some centuries ago. Most creatures avoid the crypt, so the goblins’ entry was a stroke of luck: they might be able to find enough spell components to free Zattora’s spirit. The ghost has been actively directing and training the goblins into an effective fighting force; they are unusually attentive and relatively bright. As such, an assault on the crypt will be a much more serious challenge than just clearing out a few goblins. Each goblin will have noticeably higher attack bonuses, and the ghost will be no joke to defeat. Also, several parts of the floors in rooms 2, 3, and 4 have been inscribed with magical runes that grant +2 AC to defenders and -2 AC to attackers. A lot of 200 Word RPGs lack useful randomization mechanics. You may roll a die, but even there, the result is a normal pass/fail. Today’s RPG, Nathan Knaack‘s Normaleware, is an exception. To start, I love that this game about androids infiltrating humanity not only includes Asimov’s Three Laws of Robotics, but it condenses them while keeping their clarity. I also love that character creation — rolling on two tables — doesn’t just happen once. Both are re-used later in the game, one to resolve risky actions and another if your android is discovered. But more importantly, this game executes on its premise. Your android has an objective, but every objective is very human: love, respect, fame, trust. You also have access to certain programs, but in risky situations the dice may make you do something different. After all, you’re not human; maybe you mis-read the situation. Here’s what really impresses me: if you roll poorly and the dice point you to a different course of action, you can accept that action with its consequences and earn data (free re-rolls on later risky actions). You can also choose to just fail. Why am I so impressed by this? You never reach that situation so common in RPGs, where you’re trying to bash down a door, and you simply fail to bash it down. The game’s always suggesting another course of action, which keeps the story moving. Even more interesting: probability tells us that you have only one in three chance of succeeding in risky actions. This will drive you to avoid risk, despite the inherent riskiness of infiltrating humanity and accomplishing very human goals. Roll for your directive. You win when all androids achieve their objectives. The narrator determines success criteria. You have six programs in your matrix. Circle one from each category. After each scene you can change one. For risky actions, roll twice on your program matrix. If either result supports your intent, you succeed. If neither does, but you accept the consequences, you earn data. You can also just fail. Roll thrice with advantage, once with disadvantage. Data is used for rerolls. You can also reroll by giving the narrator bugs, used to make you reroll something. You start with 3 data and can store up to 10. You can give data to other androids. If anyone discovers what you are, lose all data and reroll objective. This shrine buried deep in the jungle once held a secret, long since revealed by looters after the shrine was abandoned in a war some decades ago. Until then, most only knew of the two chambers that made up the shrine itself: the foyer where worshippers lit incense in small alcoves on either side — still visible today — and the large inner chamber, where a shrine attendant burned sacrifices on a large altar. After the war, looters broke into secret doors in the back and side of the inner chamber to reveal passages leading down into an extensive complex of store rooms. This easily defensible dungeon has since trade ownership many times between various monstrous tribes who would drive out squatters, only to be driven out by another tribe. This map can easily be stocked by any monster tribe you desire. Any given room might contain treasure from past inhabitants or spoils from raids by the current owners. Rooms 5, 6, and 12 make for good treasure rooms, and the tribe’s elite will typically stay in rooms 8 through 12. The one aspect of RPGs that I’ve seen most house-ruled are death rules. For example, in the last few editions of Dungeons & Dragons, a character that drops to 0 HP or less makes death saving throws unless stabilized or healed, and if the character fails three rolls, they die. A lot of groups nerf that. My group house rules as follows: If you fail three death saving rolls, you fall completely unconscious–attempts to stabilize or heal you fail outright–but you do wake up after combat ends. If the entire party is knocked unconscious, they all die. This is a big change from our previous campaign, where player-character death was flat out impossible. 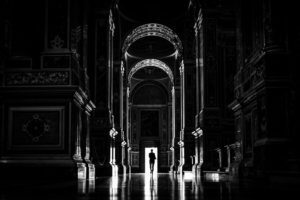 Now, I play with a group of players who care deeply about developing their characters over time, so losing one a few sessions in–or even many sessions in–isn’t fun for them. They find the plot twist of PC death less interesting than a PC changing an opinion or an aspect of their personality. On the other hand, de-fanged death drains combat of its emotional power. PCs can throw themselves at crazy enemies, because failure lacks serious consequence. It just means your character misses a few minutes of events, which the other characters will describe anyway. Some groups play with immediate death: if your PC drops to 0 health, the PC immediately dies. I’ve heard of groups where dropping to 0 health triggers the possibility of death: the player decides, in that moment, whether this is the right time for the PC to die. It causes a conscious, thoughtful decision by the player. And, of course, there are games where PC death is common and expected, as in Dread, or ones where it’s practically impossible, as in Do: Pilgrims of the Flying Temple. I’m talking about a more standard, long-running RPG. I don’t have a good answer for this. Would my players ultimately have a better/more powerful/more impactful/more emotional time if they did fear for their characters’ death? Are any of those goals more important than the others?